USA’s Tomoki Hiwatashi performs his Free Skate at the at the 2019 Junior World Figure Skating Championships. 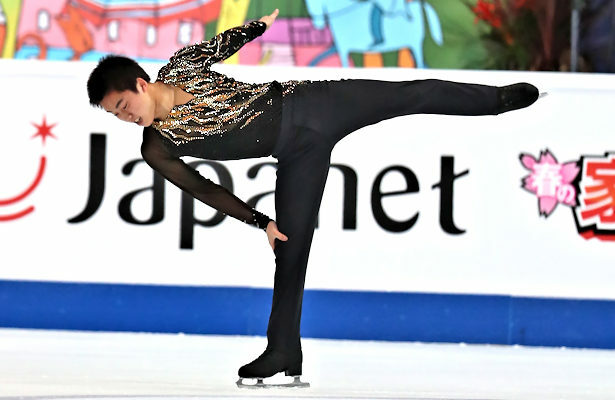 USA’s Tomoki Hiwatashi won the gold in the Men’s event at the 2019 Junior World Figure Skating Championships in what was his third appearance. Russia’s Roman Savosin rose from sixth to capture the silver, improving from his fifth-place finish last year, while Daniel Grassl of Italy pocketed the bronze in his debut at this event. Savosin took first in the Free Skate with a season’s best of 150.95, however, his skate to “Piano Concerto No 2” wasn’t perfect. While the 19-year-old landed a quad toe and quad Salchow, he under-rotated three out of seven triple jumps, including both triple Axels. The skater scored 229.28 points overall and also had the highest technical score (77.31) of the afternoon, but missed the top of the podium by just a tad of a point (229.28). “Obviously, I was aiming to move up in the standings, I was hoping for it,” said the Russian national junior bronze medalist. “I am very glad it worked out. Mostly I was thinking of skating a clean program and am very pleased with my performance today because throughout this season I never really managed to skate such a good program. Hiwatashi was nearly clean, landing a quad toe-triple toe, and two triple Axels, but the 2018 Inge Solar Memorial bronze medalist doubled his second quad toe. Nevertheless, all spins were graded a level 4 and he landed a total of seven triple jumps. After a one-point time deduction for a time violation, he scored second in the free skate (148.82) and was able to grab the title with 230.32 overall. The U.S. national pewter medalist didn’t realize he had won at first as he was only second in the free skate and second in the short. It didn’t add up for him at first. “I am very excited to go back home with my gold medal, to meet my parents, my friends,” he said. He wasn’t so happy about his second quad toe attempt. Canada’s Stephen Gogolev, finished third (143.66) in the free skate and rose to from 10th to fifth overall (220.66) in his debut at this event. The Junior Grand Prix Final champion doubled his opening quad Lutz and later took a bad fall on a triple Axel, but otherwise landed a quad toe and quad Salchow-triple toe in his routine to music from the Sherlock Holmes soundtrack. Grassl had a technically difficult planned program, but under-rotated and fell on his quad Lutz and then under-rotated a quad loop as well as a triple loop-triple toe combination. He also received an edge call his triple flip (in combination with a Euler-triple Salchow), but showed strong level 4 spins and footwork. The Italian national champion finished fourth in the free skate (143.48) and was able to maintain third overall with a total score of 224.67. Russia’s Artur Danielian under-rotated his opening quad Salchow, but landed a total of seven triple jumps, including two triple Axels, in his routine to selections from Guiseppe Verdi. The defending silver medalist, who stood in ninth after the short, earned a season’s best of 142.97 for fifth place in the free skate and rose to fourth overall (220.68). Adam Siao Him Fa of France had a turnout on his quad toe-triple toe and also stepped out a quad toe and triple Salchow, but managed to hang on to the landing of a quad Salchow in performance to “Take Me to Church.” The 18-year-old earned a level 4 on two of his spins and finished sixth in the free skate with a season’s best of 142.17. With a total score of 219.91, he was able to maintain sixth overall, greatly improving from his 17th place finish last year. Georgia’s Irakli Maysuradze finished seventh overall (217.78) in his fifth appearance at this event. The Moscow-born 18-year-old put out a strong performance which featured a quad toe and seven triple jumps, but put a food down on a triple Lutz and turned out the back end of his triple loop-Euler-triple Salchow. He scored a new personal best of 141.32 for his routine to music from The Untouchables. Both Fa and Maysuradze were also slapped with a one-point deduction for a time violation. USA’s Camden Pulkinen struggled in his free skate to “West Side Story,” taking a fall on a triple Lutz and receiving an edge call on a doubled flip in combination with a double toe, as well a solo triple flip. The 2018-19 Junior Grand Prix finalist showed strong spins and footwork, but received a two-point deduction in time violations to finish ninth with 134.27. His total score of 216.68 managed to keep him in eighth overall. Petr Gumennik of Russia fell from fourth to 10th overall (212.14) after placing 11th (131.81) in the free skate. The 2018-19 Junior Grand Prix Final silver medalist took a fall on his quad Salchow and then struggled with underrotations on three other jumps. USA’s Alexei Krasnozhon finished 11th overall (211.47), followed by Joseph Phan of Canada (209.02).